Satisfied? That is one thing we are not. We are not satisfied. We take a vacation of a lifetime. We satiate ourselves with sun, fun, and good food. But we are not even on the way home before we dread the end of the trip and begin planning another. We are not satisfied. Contentment is a difficult virtue. Why? Because there is nothing on earth that can satisfy our deepest longing. We long to see God. The leaves of life are rustling with the rumor that we will — and we won’t be satisfied until we do. When it comes to love: Be careful. Before you walk down the aisle, take a good long look around. Make sure this is God’s intended place for you. And, if you suspect it isn’t, get out. Don’t force what is wrong to be right. Be careful. And, until love is stirred, let God’s love be enough for you. There are seasons when God allows us to feel the frailty of human love so we’ll appreciate the strength of His love. Didn’t He do this with David? Saul turned on him. Michal, his wife, betrayed him. Jonathan and Samuel were David’s friends, but they couldn’t follow him into the wilderness. Betrayal and circumstances left David alone. Alone with God. And, as David discovered, God was enough. What are some ways you are not satisfied? Will you ask God to fill your voids with His spiritual peace? 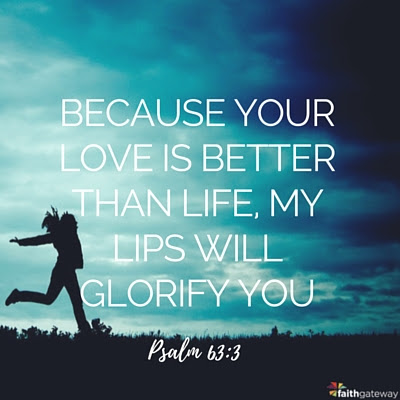 What circumstances in life remind you that God’s love is enough? Come lets hear from you.